This entry was posted in Essays new material and tagged academia Artists United Against Apartheid BDS boycott divestment Israel sanctions on December 24, 2013 by Marla Cohen. Steven Van Zandt, with Corretta Scott King and Andrew Young, during the anti-apartheid movement of the 1980s. When I was working my first post-college job in the library of the Dallas Morning News, I had more papers at my disposal than anyone in the pre-internet era would have known what to do with. As I did my work, filing and cross-filing clips and attending to back-end content of one of the first newspaper databases, I read. A lot. And I would see how one story could get picked up in newspapers across the country. One that did so was the efforts of students at Columbia University to affect the university’s investment holdings in South Africa — because it was an apartheid state, one that cruelly suppressed the rights of its black majority in favor of a white ruling class. The students had blockaded Hamilton Hall (named for Alexander Hamilton, a signer of the Declaration of Independence, so he might well be proud). The blockade and a four-day fast on the part of student leaders ended when they met with university officials. Shortly after, Columbia began the slow process of shedding its South African holdings. 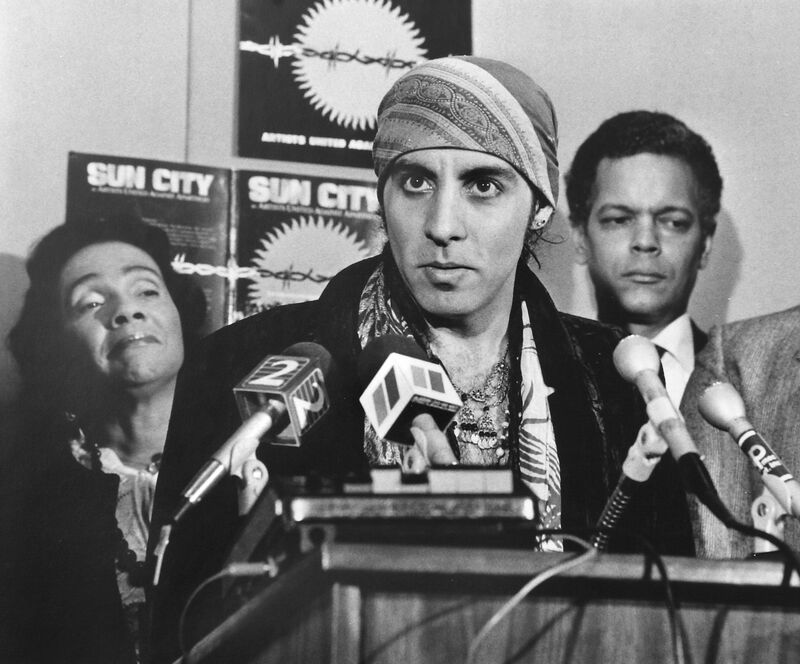 This was 1985, the height of the anti-apartheid movement, when Steven Van Zandt composed, “Ain’t Gonna Play Sun City,” for Artists United Against Apartheid, in protest against the tony casino South African resort. This particular article about the Columbia students caught my attention, however, because I was a recent Barnard graduate, Barnard being the women’s undergraduate college of the university (until that year, there were no women at Columbia College, the men’s undergraduate counterpart). Their activism was unlike anything I remembered when I had been on campus only a year earlier. They were passionate and Gen X, whereas, I and my peers were clumsily tacked onto the tail end of the Baby Boom, having missed every exciting milestone of that generation. My collegiate peer group seemed, much to our chagrin, anything but activist. My recollection is that we spent a lot of time recalling the student takeover of Lowe Library in 1968, and feeling frustrated by our own inability to do much to change our world. This memory seems very fresh right now in light of two recent events: The death of Nelson Mandela, the man who more than anyone came to symbolize the struggle against apartheid and ultimately, its defeat; and the announcement this week that the American Studies Association (ASA) agreed to support “a boycott of Israeli universities in protest of the illegal occupation of Palestine, the infringements of the right to education of Palestinian students, and the academic freedom of Palestinian scholars and students in the West Bank, Gaza, and Israel.” It was the latest development in the growing BDS (Boycott Divestment Sanctions) movement aimed at Israel. According to its website, the ASA is the nation’s oldest and largest association devoted to the interdisciplinary study of American culture and history. It was chartered in 1951. Today, more than 5,000 individuals are members, with another 2,200 library and other institutional subscribers. Even Palestinian Authority President Mahmoud Abbas, forcefully coming out against the boycott did not dissuade this academic organization. While Abbas encourages boycotts of goods made within the West Bank, he basically said that boycotting academic institutions in Israel was part of the problem, not the solution to the Palestinian situation. Sixty-six percent of the ASA’s membership voted in favor of the boycott, despite the overall opposition of the American Association of University Professors to academic boycotts. This boycott targets Israel in a way that no other country, no matter its human rights record, has been singled out. I can think of no other reason for the ASA boycott than to question Israel’s continued presence and a perverse desire to push it out of existence, the sooner the better. I look to the success student-led movements had during the 80s with South Africa and worry. That movement began at universities and spread to performers and then boardrooms across this, and other, countries. Companies divested of their South African holdings and the country was isolated, economically and politically, until 1994 when apartheid rule came to an end. You can call Israel and apartheid state all you want, but that does not make it true. Arabs are a minority in Israel. Nonetheless, they are citizens. They have the vote. They have representation in the Knesset. These were things denied to the black residents of South Africa, who lived in segregated slums like Soweto and yet made up the country’s majority of people. There is inequality and viewpoints that cannot be bridged; deals that neither one side nor the other seems ready or willing to accept. But when the top graduate of Israel’s Technion University’s medical school is an observant Islamic woman named Mais Ali-Saleh, who grew up in a small village in northern Israel, can the country really be likened to the South Africa that Nelson Mandela fought? Even Ali-Saleh herself noted in interviews this summer when she graduated, that Europeans were shocked that she lived in Israel and studies alongside Jews. The gap in understanding and reaching for the facile label of “apartheid” may be apparent to me, but it’s an irony lost on those who hold that point of view. I am not sure what a boycott of Israel is going to achieve beyond isolating the Jewish homeland. If Israel were any kind of state other than a Jewish one, would anyone care so much? Syria murders thousands of its citizens and we do not bat an eye. China is frequently cited among the world’s top violators of human rights. And yet with that nation we look to create new and deeper trade partnerships. When Elvis Costello, one of my favorite popular artists refused to perform in Israel, I was deeply saddened; much as I cheered Alicia Keyes’ recent decision to continue her tour there, despite being excoriated by Pulitzer Prize-winning author Alice Walker. In the 80s, the supporting South Africa’s black citizens under apartheid made so much sense. But it all seemed so much more clear-cut. Israel has real security issues. Palestinians want their homeland. Will isolating Israel first on an academic stage, with hopes of raising that to an international level bring this about? Mandela’s death reminded us of what you can achieve through protest, both loud and quiet. His obituary in the New York Times read like a Hollywood script of one man’s vision, overcoming the odds. Of course, history is more complex and nothing is really that simple. But I fear that in the world’s desire reduction and simple narratives, Israel has been labeled the South Africa of today, without regard to nuance or differences between the situations. Before the Nazis declared a boycott of Jewish businesses in 1933, they passed a law excluding non-Aryans from civil service. This included university professors. A generation of Jewish professors were banned from the academy, before Germany ever sent them to the gas chambers. What begins in the academy doesn’t generally stay there. It is what the ASA, I am sure, is hoping for, and what as supporters of Israel, we must warily watch, and protest. Well written! A concise and clear account of what is happening. As usual, I am so proud of you. I hope this article receives the attention it deserves – thank you!